The $4.69 million Arlington Drive Bioswale & Dry Weather Diversion Project was an outstanding example of a partnership between 3 agencies, including the City of Costa Mesa, OC Fair & Events Center and OCTA, and included extensive outreach to residents, the school district, and community stakeholders. The project was delivered on-schedule and under-budget by the Kabbara Engineering design team and fulfilled its public commitment to enhancing water quality, flood protection, traffic safety, access and beautification. The Kabbara Engineering Team narrowed the east end of Arlington Drive to one lane in each direction, allowing us to meet the funding transportation nexus and create a bioswale to treat the runoff by trapping the primary pollutants of concern (Cadmium, Copper, Lead, Zinc), promoting infiltration and reducing storm water runoff to the Upper Newport Bay, an Environmentally Sensitive Area, and a high priority clean-up area, designated by the Santa Ana Regional Water Resources Control Board. The Kabbara Engineering Team effectively designed the new bioswale improvements to mitigate 100% of the tributary water quality flows, which included a complex series of flow splitting devices that were designed to capture and treat the water quality of “first-flush” surface runoff in the bioswale, while allowing larger flows to by-pass and enter the storm drain system during major storm events, all while meeting flood protection goals under both existing and future development conditions. In addition to the excellent water quality benefits, this project has resulted in numerous outstanding benefits to the community and their public agency partners, including traffic calming and implementation of the City’s Bicycle Master Plan with 1 mile of a new off-street meandering and curb adjacent multi-purpose trail, landscape planting, irrigation, and pavement rehabilitation improvements which serve as safe public access to an adjacent college, high school, middle school, Tewinkle Sports Park, Volcom Skate Park, and the OC Fair. This project also resolved severe flooding issues with construction of a 54” RCP Master Planned storm drain system and improved safety and driveways to the OC Fair for bus and truck trailer access. Access to parks and schools was also improved by installation of a new mid-block traffic signal and 3-way intersection stop to enhance pedestrian safety, and the addition of new diagonal on-street parking spaces to better serve the Parks. 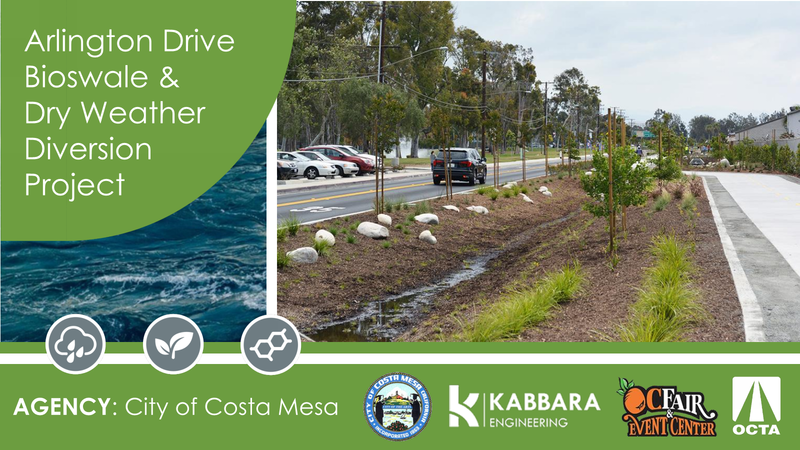 Kabbara Engineering prepared the Measure M2 grant application for the City of Costa Mesa, that was ranked #1 by OCTA who partnered with the City of Costa Mesa to provide $1.528 million dollars of the total $4.69 million dollars in funding for this project. A close working relationship and on-going coordination with the OC Fair & Events Center board and their stakeholders resulted in another partnership with the OC Fair to provide an additional $1.5 million dollars of funding for this project. The excellent relationships and communication with the community stakeholders and the Project team, and detailed construction phasing and scheduling which allowed for relocation of a 36” reclaimed water main by Mesa Water District and allowed the OC Fair to go on as scheduled and with the best attendance ever, resulted in a project that was successfully delivered by the Kabbara Engineering design team, with minimal impacts on the surrounding schools and parks. This project successfully fulfilled its public commitment to enhancing water quality, flood protection, traffic safety, access and beautification. The City of Costa Mesa, their project partners and the Kabbara Engineering Team are honored to have received the 2018 APWA B.E.S.T. Award (Storm Water Quality) for the Arlington Drive Bioswale and Dry Weather Diversion Project. The Arlington Drive Bio-swale & Dry Weather Diversion Project was an outstanding example of a partnership between 3 agencies, including the City of Costa Mesa, OC Fair and OCTA. The project was successfully delivered by the Kabbara Engineering design team and fulfilled its public commitment to enhancing water quality, flood protection, traffic safety, access and beautification. The $4.69 million Arlington Drive Bio-swale & Dry Weather Diversion Project was an outstanding example of a partnership between 3 agencies, including the City of Costa Mesa, OC Fair & Events Center and OCTA, and included extensive outreach to residents, the school district, and community stakeholders. The project was delivered on-schedule and under-budget by the Kabbara Engineering design team and fulfilled its public commitment to enhancing water quality, providing flood protection, improving traffic, pedestrian, bicycle safety and access, pavement rehabilitation and streetscape beautification.